Here in our pet stuffed animals section, you’ll find a purr-fect variety of squashy cats and soulful stuffed toy dogs. From cuddly and chunky to sleek and tailored there’s a stuffed toys dog and cat for everyone. No child can resist a game of cowboys when they see one of the many horses we have to select from, and no adult can help but smile when they see them. Find your favorite breed in our Horse section that’s full of the American favorite. In the Critters divide you’ll find such heart-tugging ferrets , hamsters and plush pets you’ll almost dance in delight. A chunky little hedgehog and delicate bunny rabbit round off the Critters and lead us right to the plush farm animals. People young and old can’t help but squeal when they see the baby ducks that make a picture-perfect baby shower gift. 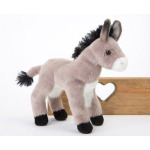 Boasting donkeys, pigs and other farm life fun, this sub-section along with the rest of our Domestic animals and plush farm animals are sure to make the perfect gift or collectable for your needs.